High quality blend of proteins that make your diet will come to the next level! Excellent flavor, solubility, and stirring. It consists of 80% pure protein. 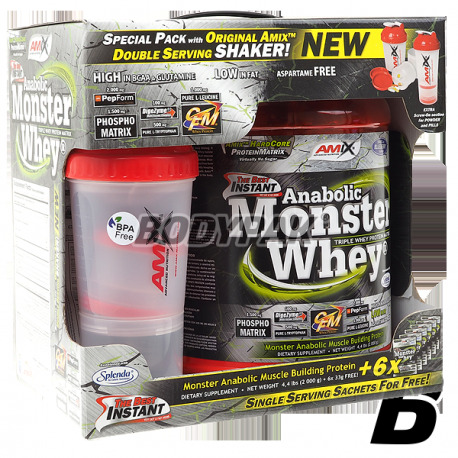 Amix Anabolic Whey Monster, an excellent flavor, solubility and mixing. It is 80% pure protein. It consists of matrix protein, whey concentrate, whey isolate CFM and hydydrolizat, micellar casein, and amino acids derived from protein isolate beef with a very high biological value. It also contains a high dose of BCAA and L-glutamine. 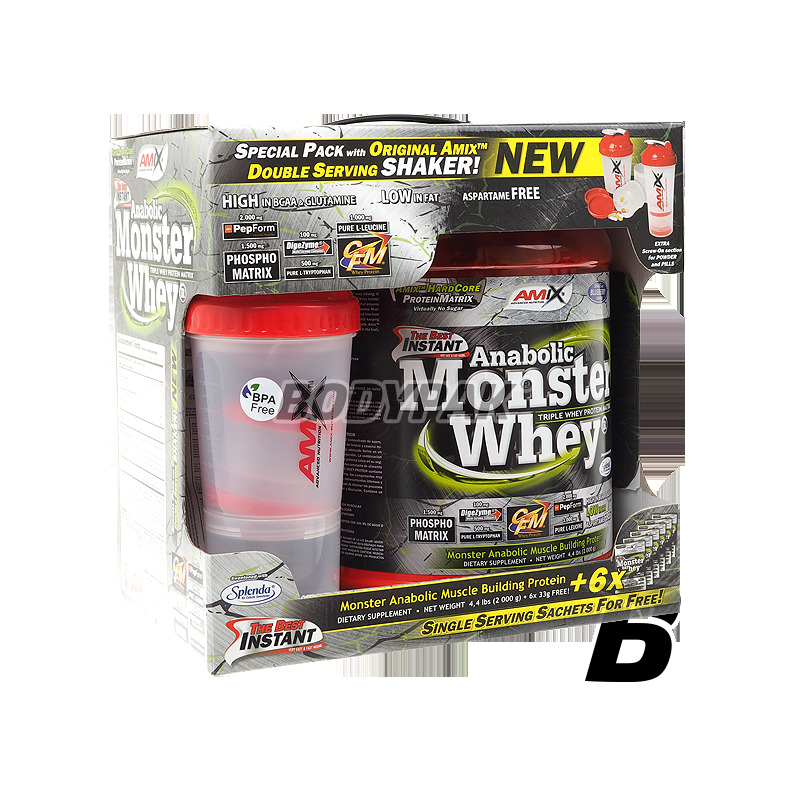 Amix Anabolic Whey Monster, moreover, has in its composition relationship Pep-From (Leucine Peptides) and leucine-free form, in order to increase anabolism. The advanced formula provides a constant supply of essential amino acids, which are key to the growth of muscle mass. It inhibits catabolism and starts the process of protein synthesis in the body. Ingredients: Amix ™ Triple Whey Matrix (whey protein concentrate) - Institutionalized, CFM - protein isolate contains protein fractions - beta-lactoglobulin, alpha-lactoglobulin, bovine serum albumin, immunoglobulin, glycomacropeptide, micellar casein cocoa powder (only in chocolate flavor), Pep-Form® peptides - leucine, L-leucine, dicalcium phosphate L-tryptophan, potassium di-phosphate, stabilizers - xanthan gum and guar gum, soybean lecithin, natural aroma and the same natural sweetener: sucralose and acesulfame-K, Splenda®, dye: (banana - curcumin, strawberry, raspberry Apples, cinnamon, melon-yogurt - tartrazine and blue patent V), a patented DigeZyme® digestive enzyme blend (amylase, lipase, lactase, cellulase, bacterial protease). Jak dla mnie nie zawodna sprawdzona marka. Pozytywna ocena. Cena dość wysoka ale za to przyswajalność na bardzo wysokim poziomie. Smaczne białko, bardzo dobrze rozpuszczalne. Jakościowo nie odstaje od konkurencji. Cena mogłaby być jedynie niższa, bo jednak jest to tylko 80% białka.